Fitzgerald’s Supper club in Middleton has been on my list of restaurants to visit for a couple years now but something more exciting has always beaten it out. This past Friday when my Mom came to visit seemed like a great opportunity for a good steak and salad bar. The decor was underwhelming with splatter painted walls and a color scheme I can only describe as mauve-ish brown. We got a pretty prime table at the front of the dining room in an elevated cluster of tables. We went pretty early in the evening so it was quiet in the dinning room but when we left the parking lot was full and there were people waiting for our table. Our service throughout the entire night was above average and our food came out extremely fast. 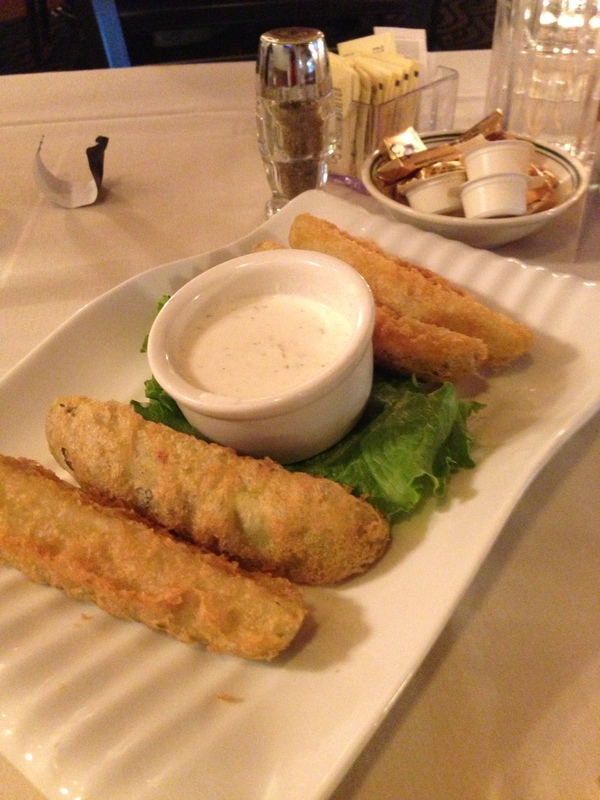 We ordered the fried pickles as an appetizer and they came out hot and very crispy. The batter was clearly a homemade beer batter and the pickles with their homemade ranch dressing were some of the best ones I’ve ever had. The salad bar offered typical supper club ingredients including some really good pickled beets, a couple cold salad options, two different types of soup, and hot garlic bread. I love salad bars so I might be biased but it was a very good start to our meal! They had a lot of different entree options but going to a supper club in my mind either means steak or fish fry so I got the ribeye and my mom got the fish fry. Mom’s fish had the same light and crispy beer batter on it and it came with some tasty homemade fries. 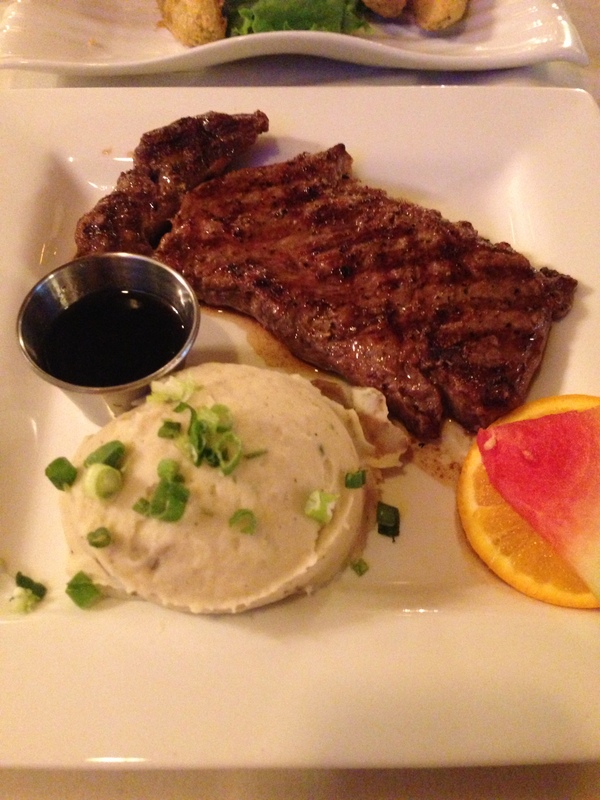 My steak came with a couple options for a side but I went with the garlic mashed potatoes, which were an amazing combination of red potato skins, creamy garlic potatoes and scallions. My steak came out cooked perfectly and was seasoned extremely well. I was very impressed all together with Fitzgerald’s and was very happy to eat leftover steak and french fries from Mom’s fish fry for dinner last night. FOODNOTES: Great option for steak or fish fry, prices about normal for a traditional supper club, could use some decoration updating, service was fantastic, will definitely go back.